This scenario was based on ideas contained in Donald Featherstone's book Solo Wargaming. In particular, he has a nifty idea for generating random reinforcements which would give the game a bit of a twist. Rules for the game itself will be Rank and File. Each side would have 1 Cuirassier and 1 Dragoon regiment (plus a Brigadier) on table at the start of the game, acting as advance guards. These units would have five moves to wrestle for an advantage before reinforcements arrived. The forces available to each side were divided into seven groups, some a single battalion or regiment, some a group of 2 or 3 units. The remaining brigadier generals were randomly allocated to the groups as well. These groupings were then written down on slips of paper. Then, for each side, five envelopes were numbered 6, 7, 8, 9, and 10 on the front. They were then turned over, shuffled, and arranged on a table in line. They could then be mentally numbered 1 to 5 from left to right. The slips of paper (piled face down) were then blindly allocated to the envelopes using a D6, with a throw of 6 meaning 'roll again'. With all slips tucked away, the envelopes could be sealed and collected together, then once again re-arranged in order of the numbers on the front. Thus I could create a totally random set of arriving forces for both sides before the game. The C-in-C would arrive on move 6, accompanied by whatever forces (if any) were in envelope 6. These would arrive on the baseline wherever the C-in-C preferred. Forces arriving in subsequent moves would be allocated an arrival sector on the baseline by dice throw when they arrived. Set up and position of the advance guards. I laid these out before my opponent (Paul) arrived, pretty much where I fancied. We diced to see who would be Prussian and who Austrian, then we were set to go. The Austrian cavalry (commanded by myself) wait impatiently for the off. With a minimum of preliminary manouvering, the two cavalry groups got down to the serious business of lining themselves up for charges and the subsequent melees. 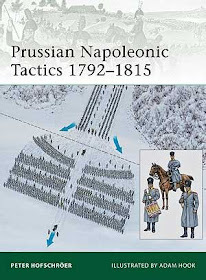 The Austrians came out on top: the Prussian dragoons were completely routed, and although the Austrian dragoons were beaten back, they were still in good shape to continue, once the reinforcements arrived. Paul considers the arrival of his first reinforcing units. As you can see he is a little fuzzy-headed. Well, he was already on his second glass of red wine. On the Prussian left, 2 line battalions advance with confidence along the line of the ridge. They are opposed by a single Bavarian battalion (rated green) coming the other way. Doesn't look good for the Bavarians. On the other flank, the Prussian grenadiers form together into a brigade and push forward. Austrian infantry and guns have arrived in the background. The Austrian cuirassiers are falling back, hoping they won't be caught in the rear (ouch!). More Austrian units crowd onto their baseline. The light infantry arrive conveniently on the Austrian left. The farmstead here provides the perfect position for them to occupy. The Bavarians look on nervously as the enemy infantry manouvers across their front. What are those damned Prussians up to? Later position on the same flank. Now the Bavarians are facing cavalry as well as infantry. Help is on the way but it will not arrive in time to save them. They were charged (by the infantry) and routed. In the centre, the Austrian infantry shapes up to oppose the enemy grenadiers, who are nicely supported by both Prussian gun batteries. The Austrian gun position. As things turned out, they were not really in the best place and did not have the effect I had hoped for. In the centre, the Prussians have the best of it. The right hand Austrian battalion is down to 50% (those blasted guns! ), and both Austrian units are unsteady and falling back. This last picture was move 13, by which time the Austrians had lost 6 of their 24 army points, causing them to waver (under my house rules - see previous post). The Prussians had still lost only 4 out of their 24. We had run out of time, and so a minor victory for Frederick's men was declared, although there was still plenty of life in the game and things might have gone the other way in time. At least that's what I think. A very nice, fun, evening game. We found the need to add one house rule, or house clarification if you will. When deciding if a unit is within charge range of the enemy, we take it that it is if half or more of the stands are in charge distance. This caters for those situations where the opponents are not lined up parallel to each other. One minor point to close with. I have found my Austrian light infantry have not been having the effect on the table they seem to have had in real life. Although they were not really designed to take their place in the line of battle, they seem to have done very well in a number of set-piece battles (Kolin and Lobositz being 2 good examples). Therefore I will be increasing their size from 4 to 6 bases. Less obviously, I will also try rating them as veteran to see how that works. Finally, my copy of Black Powder arrived this morning. Time to get reading!